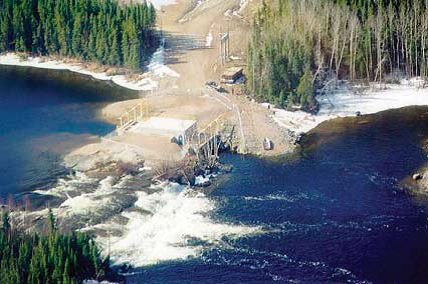 Figure 6: Run-of-River Small Hydro Project in a Remote Community. Therefore an appreciable and constant flow of water is critical to the success of a commercial small hydro project. 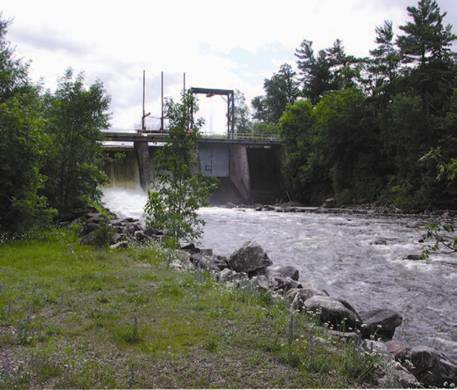 The flows on Ontario rivers are not consistent or sufficient to make these proposals pay for themselves as a simple run-of-river operation, so developers in an attempt to maximize profits and to utilize the generous FIT Program, with its 35% peaking bonus, use peaking or cycling strategies to produce power during peak demand hours. ORA’s concern is that a developer led Class Environmental Assessment is not rigorous enough, and relies too heavily on the integrity of the developer to ensure environmental considerations are adequate. This proponent led process has effectively placed the Fox in charge of the Chicken Coop. The following information on Waterpower Structures was cut and pasted from the Ontario Ministry of Energy’s website only a few months ago, however, it has since disappeared from their site. The Run-of-River definition is in total agreement with the Natural Resources’ definition. There are a number of different types of waterpower structures. The choice of waterpower structure for a particular site depends on many things: the terrain, the amount of water available, environmental impacts, construction and operating costs, local energy demands, and economic viability. Run-of-River: A run-of-river facility uses only the natural flows in the river, as they are available, for generation. Therefore, all flow in the river is either passed through the plant, or partially released around the plant if the flow exceeds the capacity of the plant. Run-of-River with Modified Peaking: Many run-of river plants allow for limited storage of water. A run-of the river plant with modified peaking, however, allows the plant to produce more electricity during periods of high demand, and save water during periods of low demand for use at a later time. Run-of-River facility on the Bonnechere River. 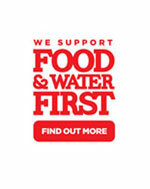 Courtesy Ontario Waterpower Association. Run-of-river: Uses only the water that is available in the natural flow of the river, and implies that there is no water storage and that power fluctuates with the stream flow. Reservoir Storage and Cascade Systems (peaking): These systems use reservoirs to store water during periods of high flow, such as the spring to be used to generate electricity during low flow periods such as the winter or summer. The reservoirs may be managed specifically for waterpower production at the site or may serve a series (or cascade) of facilities downstream. Pumped Storage: Pumped storage facilities pump water from a lower reservoir to a higher reservoir during off-peak periods. This water is then released from the upper reservoir through the plant to generate electricity during peak periods. One example of a pumped storage facility is the Sir Adam Beck facility in Niagara Falls. Kinetic Hydro: Kinetic waterpower systems are an emerging technology in Ontario. Turbines are placed in the river and use only the existing water flow, without a head, to generate electricity. Kinetic systems are generally used for smaller scale projects such as a remote cottages or resorts. The challenge is that many of the new proposed dams in Ontario are being sold to the public as Run-of-River, when in fact they are “modified run-of-river”, or used as a “cycling” facility.